Here's my idea. Restaurant reviewers are always posh chaps, constantly wearing unusually fashionable clothing, and speaking with a nasally voice that drips with condescension. They're very finicky about their food, mostly eating it for the aesthetic sense of it and not because they're actually hungry. Me, on the other hand, I just eat because I'm trying to keep my body alive for another day. I actually don't read restaurant reviews, for the simple reason that most restaurants I go to I've already been there before and know what to expect. Looking back on it, in fact, I don't think I've ever gone to a restaurant for the first time. Just like I never eat anything new for the first time, innately knowing what I like. But it seems like I must have read a review at some time in the past, otherwise how would I know of the posh chaps' manner? OK, my idea: What we need is more true hillbilly restaurant reviewers. I can say this, since I have hillbilly roots, they don't really care that much about ambiance and the aesthetic appointments, being content with paper plates, plasticware, and even hand-me-down napkins. I'm saying this as a guy who's eaten turtle we've caught, dandelion greens, and drank from the family ladle. So let's pick out a restaurant. I have one. 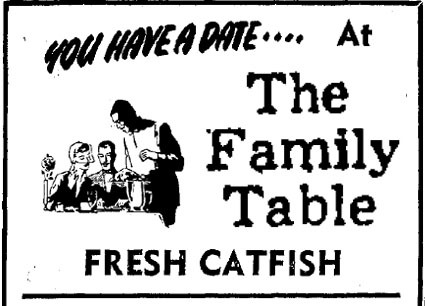 We'll go with the Family Table out on the east side of town. It's not a franchise. But they have two locations that I know of. There's one down south, at a town about 40 miles south of here. People kept going there for the races, then they'd stop at the Family Table, and since they liked it so much, they said, "You ought to build one closer to home." So they did, although they didn't really build it, because it used to be Ken's Pizza. I've been out to eat at the Family Table. I was very happy with the staff, the service, and the food. They put on a heck of a feed, but I'm not telling you anything. Everyone knows it! I went there for dinner, straight-up noon. I was with a couple of my kin, and we were all pleased with everything. Aunt Elvira had -- I can't remember what she had. Cousin Lou, I remember her plate was nice, and what she ate, she liked, but she was feeling sick before we got there. As for me, I can't forget what I had, because it was that good. I had the catfish platter. If you've had the catfish platter out at the Family Table, you know this isn't a frozen fillet bought off a truck in a parking lot. This is the actual fish, bones and all, fried to perfection, just the way anyone would like it. Then there's all the fixins added, and it's still under 10 bucks. As I recollect, there was potatoes, beans, a piece of homemade bread, and a dish of chocolate ice cream. With the entree -- the fish -- taking up quite a bit of room, it was that big. I strapped on my feedbag and set straight to working on it. I can eat a catfish probably faster than anyone, since I've done it enough times, I know where all the bones are. But I took my own sweet time with this one. Two reasons, 1) I only had one fish to deal with; and, 2) I wanted to savor the thing. Because I had my mouth set for a good catfish, and that's exactly what I got! It was succulent. By that I mean it was good! Even the tail was done to my liking, crispy without being burnt. The only thing I could want besides would've been some catfish eggs, but of course you never seen them in a restaurant. Friends, this was a good meal. I packed it away, then let out my belt a notch, quietly burped, and felt glad. I picked my teeth with my hunting knife, went home, guzzled down a Bud, and took a nap till 4 o'clock, nearly time for supper!